Come and join us in celebrating the culmination of weeks of knitting, felting and construction. This Spring Kilkenny Arts Office embarked on a very exciting project which connected creatively with our community both rural and urban. 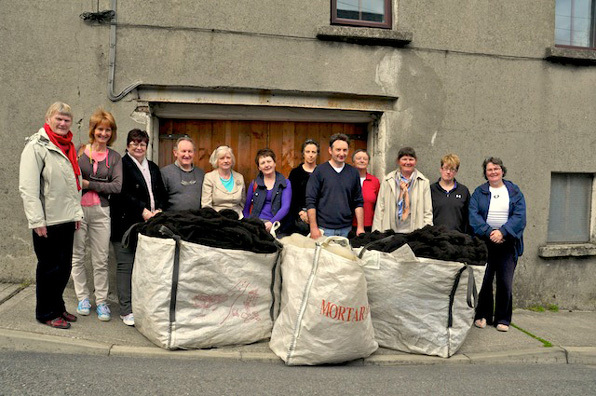 The project is a comprehensive inclusive one which involve the shearing of eighteen Zwartable sheep, the washing, carding and spinning of that wool and finally the knitting and felting of the wool to create an installation / exhibition piece for this year’s international Sheep Shearing competition. The creation of the exhibition piece(s) will be undertaken by a number of local enthusiastic, keen and talented knitters with the assistance and supervision of Deirdre Harte artist / ethical designer and Mary Butler Arts Officer with Kilkenny County Council. The project is involved in and engaging with the Year of Craft, the All Ireland and International Sheep Shearing Championships to be held in Kilkenny from 4th to 5th June at Cillin Hill, Kilkenny. It’s also embracing Kilkenny’s current status as the first Age Friendly County in the South East. This project is funded by Interreg and Kilkenny County Council.